Whenever on an airplane, I love to be well prepared with reading material. I usually bring at least one paperback or hardcover as well as my Kindle so that I can occupy myself during those minutes when no electronic devices can be used. At the end of June (the 27th, to be precise), I started reading The Evolution of Bruno Littlemore by Benjamin Hale on a return flight to Salt Lake City from San Jose, California. It was a short flight, but I was able to make some decent progress. Or so I thought. It’s now August 9th, and I still have not finished reading The Evolution of Bruno Littlemore, and I have no intention of finishing. I’m a fast reader–any of my reader friends will tell you that. My husband will tell you that I read a lot of “stupid” books. In fact, he just told me exactly that when he saw me reading The Evolution of Bruno Littlemore and after I told him a little bit about the book. While I don’t agree that this book is necessarily “stupid”, I do believe that it’s most definitely not the right fit for most readers. 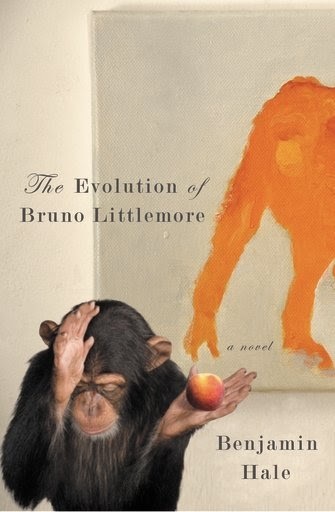 The Evolution of Bruno Littlemore is written in first person from the perspective of Bruno, a chimpanzee raised in a zoo and trained by a primatologist how to communicate in the English language. To continue his “education”, Lydia (Bruno’s caretaker) takes him into her home. Her decisions regarding Bruno cost her not only her job, but maybe even her ability to make rational decisions. I can’t argue that Hale is a talented writer. I have no issues with his grammar, characterization, or his ability to come up with a completely unique plot. Hale began to lose me with far too much description, rambling, and slow pacing. He also uses a lot of blatant foreshadowing where Bruno–who is recording his story with a character named Gwen who never actually has any lines–hints at something interesting, and promises he’ll return to it later. It must occur much later in the story, or by the time I have reached those points, I’ve forgotten about the previously foreshadowed bits. I initially kept reading because Bruno is a very unique character; I cannot think of a single book where a primate narrates his story in such an eloquent, verbose manner. I’ve now discovered I’m far too impatient with this style of writing. Bruno also indicates that he has murdered someone, and I really wanted to find out whose death he is responsible for. 256 pages in–which is where I’ve decided to throw in the towel–the victim’s name has not been revealed, and there is always the possibility that I as the reader have not yet met that individual. At this point, I’m not in the least bit curious about that storyline anymore. Page count has never mattered to me with a book; as long as the book interests me or comes highly recommended from trusted reader friends and online reviews, I’m willing to give it a shot. In the case of The Evolution of Bruno Littlemore, I honestly feel this book could have been trimmed down. Not a whole lot has happened, and it’s taken almost 300 pages to cover hardly anything. Ultimately where Hale lost me as a reader was when he created a very uncomfortable relationship between Bruno and Lydia. One night while she lay sleeping in bed, Bruno raped her. She explained to him the next morning why it was wrong, but later on she sexually pursues him. I do not care how human-like Bruno has become at this point in his life–this disgusts me. Hale goes into excrutiating detail about their sexual acts, which is more than likely to offend or turn off readers. Since from the very beginning of the book Bruno has talked about his love for Lydia, I know there are many more pages that will be devoted to their “love story”, and I know myself well enough to know that I simply can’t stomach it. The Evolution of Bruno Littlemore has won awards (Michener-Copernicus), and much buzz over its controversial nature. While some people may find value in the themes this novel presents, I was not able to connect with any of it.